How many mpkwh do you get? 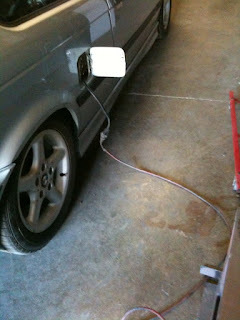 Narrative of my project converting a 1997 BMW 318ti from gas to electric. I suspect I might have crossed some sort of line here. I'd guess that the "validity of the BMW Limited Warranty" might have been affected. I did get the power steering pump to work...makes things a lot more pleasant. I reinstalled the rear seats and trunk upholstery yesterday. Now I can take the kids to school. The PakTrakr display works great. I'll have to check out the serial link soon and figure out how labor intensive data logging is going to be. I also haven't installed the monitor on batteries 7-12 yet. That means finding two more holes in the firewall. It's also tricky because batteries 7 & 8 are in the rear, so I had to run an extra cable to the back end for those leads. It's really starting to look like a normal car again. 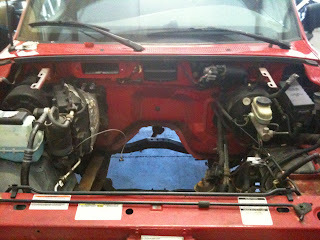 Once I get the heater core finished, I'll be able to reassemble the console and dash. Then it'll be entirely stealthy. I'll have to get some green pinstriping or something to get the attention I crave. I'm starting to get used to the "slammed" look. I don't know if I'm going to follow through with some sort of spring adjustment. I did take it on another longish trip last week. There's some factory trained independent BMW mechanics a couple of towns away. They're the ones that bought the 4cyl and other parts. It needed a brake job before I started all this so I took it up to them so they could see the finished product. I figured out that their shop is 15 miles away, so I ought to be able to get up and back without getting too close to my current max of 37miles. I forgot about any sort of post-install test ride as well as any drain from the now-functional PS pump. I wound up limping home after a round trip of 34 miles. The next charge was 13.9kWh (out of a max 14.5). I'm very pleased with the way things are holding together. I'd half expected something to go snap-fooey by now. I keep looking for stuff. The day after the brake job (new pads & rotors), I drove it from the house to the office and noticed a smell. When I got to the office, I raised the hood and felt some of the cables, the controller etc., and sniffed around a little bit. I finally realized that the smell was not any of my stuff, it was the new pads settling in on the new disks. I love it when it's the normal things that are issues rather than my conversion work. The same thing happened with a noise that popped up about 100 miles ago. I listened hard to determine whether the noise might be the impending breakup of the adapter or one of the other things you read about on these forums. It was road-speed related rather than motor speed, so that's good right? Maybe it's a bearing or something on the 207k, 13 year old donor? What about the driveshaft...did we not tighten it right when we put it back? No, while we had it up on the rack for the brake job, we noticed that the noise and heat insulating blanket pieces around the tunnel just behind the transmission had fallen down and were polishing the driveshaft. So, no conversion drama, just simple age. I love it. This thing's a lot of fun if you're not worried about range. I'm getting more comfortable with goosing it if I know that I'm only headed 10 miles before landing somewhere to charge. When the combination of location and schedule is right, it's quite enjoyable. I suspect though that living with it will always mean more planning than a regular ICE ride. So the EMW is back on the road. It spent a couple of months down at the shop getting the fabbed pieces painted and replacing the plywood control board with butcher block (and a brace). I also rewired the MR2 Power Steering pump with official Toyota connectors. I put in VoltBlochers to protect the Odyssey AGMs from overcharging. I also installed the sensor wires for one of the two PakTrakr strings, but haven't run them up to the monitor yet. However, the PowerSteering still isn't working, and somehow the clutch needs to be bled again. I'll have to keep an eye on the brake fluid reservoir level. It looks like the tap for the clutch is shamefully near the top of the tank-let. However, in the eternal quest for a bright side, at least it gave me good exposure to clutchless driving. While it would probably workout fine over the long haul, I'll be glad when I have the option of clutching again. There were times when it just didn't want to go into gear. So the 37 miles: I'd originally hoped for 30-40 miles (see initial posting, 1/12/09). I'm very pleased with the 37. I was running a 3 mile rectangle on the edge of Fayetteville. There were some hills; think of holding two diagonally opposite corners of a piece of paper up about an inch and then running around the edge. So, even though there was coasting, there was also pulling, so I'm calling it roughly similar to daily driving. Two stops per loop; pulled out in 2nd gear. Then a clutchless shift into 3rd for most of the next straight. Two rolling right angle turns; pulled both of those in 3rd. Average speed was probably 35-40mph. The pack voltage started out around 155V (12x12V Odyssey PC2150 105AH). In general, when the drive is on, the pack voltage drops 10-15V. On that last lap, the open circuit voltage (one of the contactors opens when coasting) was around 135. When I stomped on the pedal coming out of one of the corners, the voltage sank rather than current spiking. If I was more gentle, it would hold up. It was definitely time to limp home. So, now I know what the range can be, and I know how to recognize when its time to head home. I'll avoid getting so deep into the capacity for the most part. I don't have any budget for replacement batteries. By the way, I'm still trying to find the right nickname for the car. EMW doesn't really ring. e3 is okay. Then there's 'eemer'. If I left it to the kids, it would wind up with an "ey" on the end; something like "Shockey", "Chargey", or "Beemey". Any suggestions? In both cases, that includes 230 lbs of me. The only variable was that I went different places for the weigh-ins. The first was a landscape rock yard and the second was a trash transfer station with a longer scale table. Whatever. I'm still going to drive it. I do anticipate some stiffer springs in the rear. It's too soft going over railroad tracks. By the way, that trip down to the scales was also my longest run to date, 16 miles at an average of 35-40mph. That route also included a 1/2 mile 10% grade (up) at mile 12. The car did great, started the hill at 45mph, then watched the ammeter all the way up, trying to keep it between 300 & 400A, and got to the top at 35 mph. I definitely have a lot to learn about how to drive this thing. I still haven't taken the time to run it all the way down in an endurance test. I need to so that I'll have a little more peace of mind about running it on errands. Splash shield for Commutator end of motor It's a journey, not a destination right? Oh yeah, I also finally got around to pricing a new windshield. I was pleasantly surprised, it was only around $200. That will be money well spent. There's some nifty rorschach style cracks running back and forth across the original windshield. All I see is food. really. I think the only thing holding it together is the Lousisana registration sticker and La.State Patrol Supporter sticker (somebody in this vehicle's past was hedging their bets). As mentioned earlier, the next conversion project is my dad's Ford Ranger. 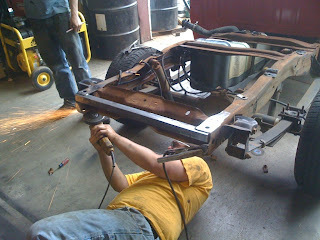 The guys at Vision Steel hopped right on it, and already have all the big parts out and have cleaned up the chassis. This should be considerably easier than the BMW. Lots of access to the frame, more depth under the hood, etc. The other benefit is that all of the core electric components are the same and VS already has 2D files for the mounting brackets for motor, pump, etc. Here's some pix. I'll post the design goals in a separate post. 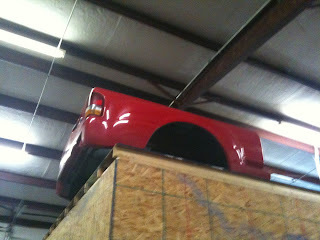 I stopped by the workshop today to plug in the charger and see what happens. Again, no sparks. The blinky lights on the charger made sense, so I left it going for the day. If he gets time, James is going to bleed the hydraulic clutch today, and I plan to bring it back home. Figure out Air Conditioning (we mounted the original compressor near the stub-shaft so that we could drive it off a pulley later on if I wanted to). I may go with a bucket of ice instead. Not much time this evening to document everything, but I did want to at least post that we had the first test drive(s) this afternoon. I've definitely got the "EV Grin" that I've read so much about on the web forums. It was a beautiful day, and I just couldn't think of any reason not to go ahead with the drive. Last night I hooked up the all the batteries and re-did the original BMW battery connectors to fit my smaller 12V house battery. I applied the heat sink goo to the controller and tightened all the electrical connections. There wasn't much else to use as an excuse for putting off the first tests. So, this afternoon after work, I went down to the workshop and we rolled it out. There's a few issues to be cleared up. The power steering pump never came on. I'd guess that one or more of the flimsy pins in my fancy radio-shack connector pushed out instead of making contact. I'll check that out over the next couple of days. Additionally, we've got to do a better job of bleeding the hydraulic clutch; today it didn't really ever seem to release. The driving was great though. Great pick-up, very smooth, no mechanical noises indicating misalignment of the motor shaft with the transmission. The brakes worked fine. I could hear the vacuum pump coming on and shutting off periodically as expected. We drew quite a crowd at the shop this afternoon. The registration on the car has expired and the insurance suspended (on purpose....) so we couldn't head out on the roads. However, the parking lot between warehouses allowed for plenty of zipping back and forth. Several of the guys who've been watching were very surprised by the pickup. Several of them took turns getting behind the wheel, and everyone came out grinning. It's definitely an odd feeling. On my first drive I noticed that the ride was very rough, almost wobbly. On my second pass, someone posed the question "Did anyone tigthen the lug nuts since we had the wheels off?" Sure enough, two wheels were very loose. See, some problems do have simple solutions.